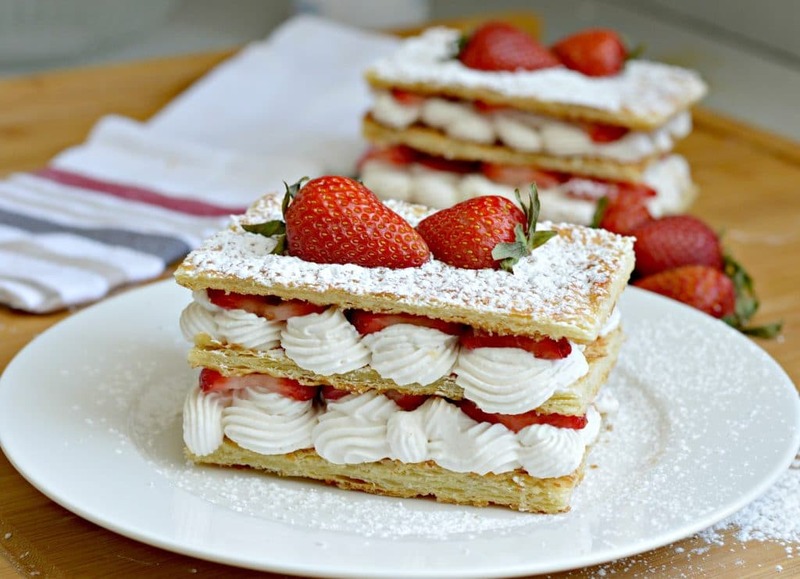 The delicious dessert known as a Strawberry and Cream Napoleon is of French origin and is also known as mille-fueille, or “a thousand leaves.” It consists of puff pastry cooked and cut into squares, with layers of fresh cream and strawberries and is topped with powdered sugar and more fresh strawberries. 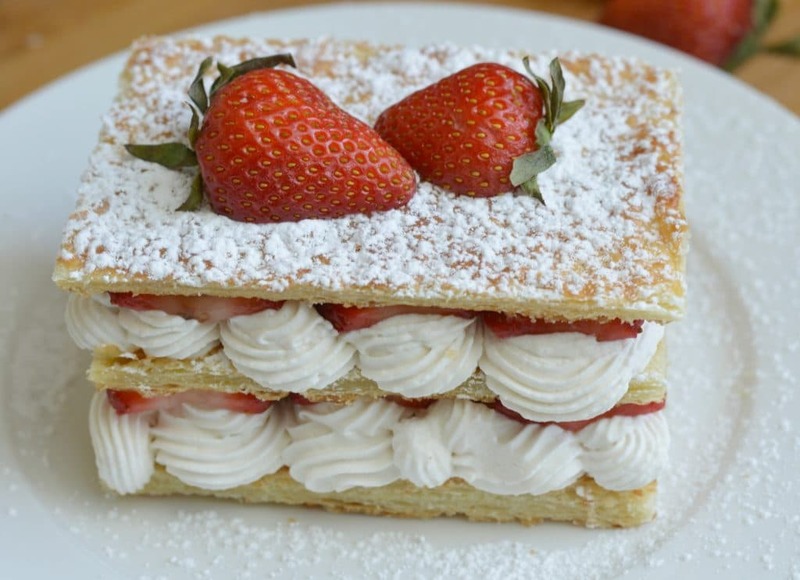 There are also other versions that are savory, but today I am excited to share this sweet Strawberry and Cream Napoleon recipe. It is so easy to make, and your guests will all be happily surprised when you serve them this. 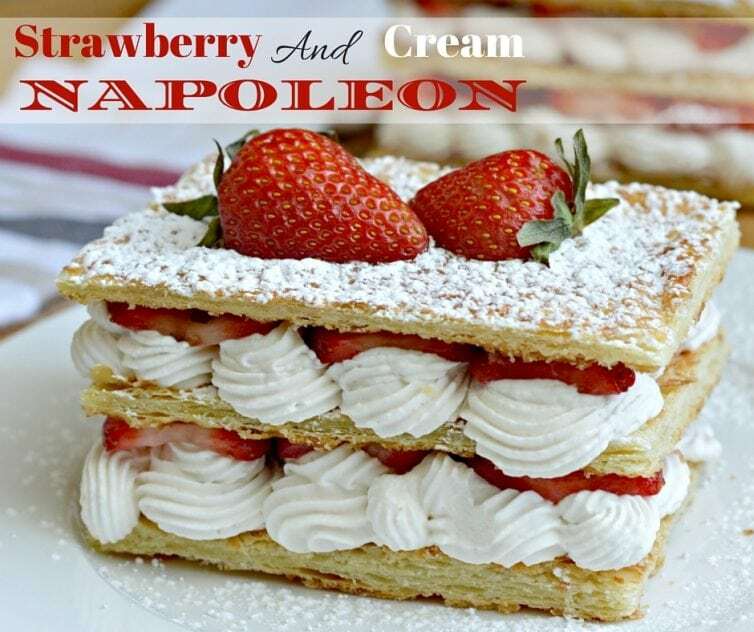 This Strawberry and Cream Napoleon is ideal for special occasions such as Valentine’s Day or your anniversary. Of course that doesn’t mean that you can’t enjoy it at any other time too! The presentation looks very sophisticated and elegant, but it is very easy to make, especially if you already have ready to use puff pastry on hand. I found it in a local grocery store in the frozen foods section next to the pie crusts, but you can also check it out here. 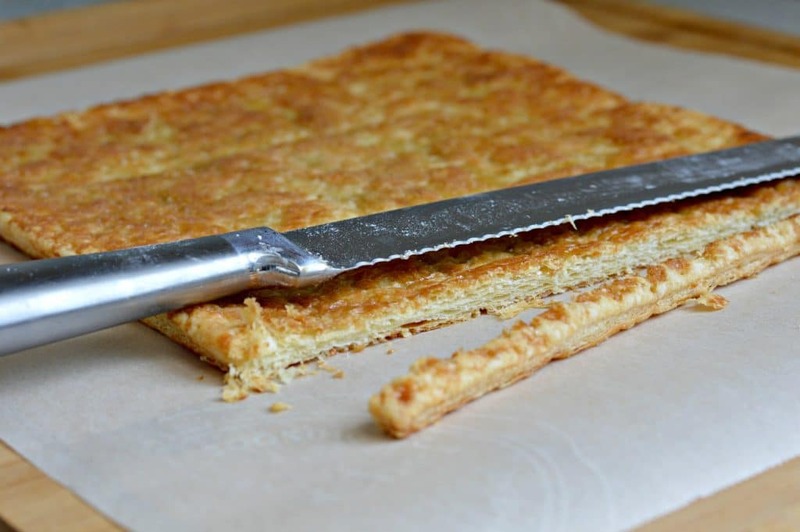 In order to make a perfect Napoleon (in my opinion), its best to keep the pastry as flat as possible, and to make sure that it doesn’t rise too much while baking. My technique for doing this is very simple. All you need to do is take a fork and poke holes throughout the entire sheet of puff pastry on both sides. 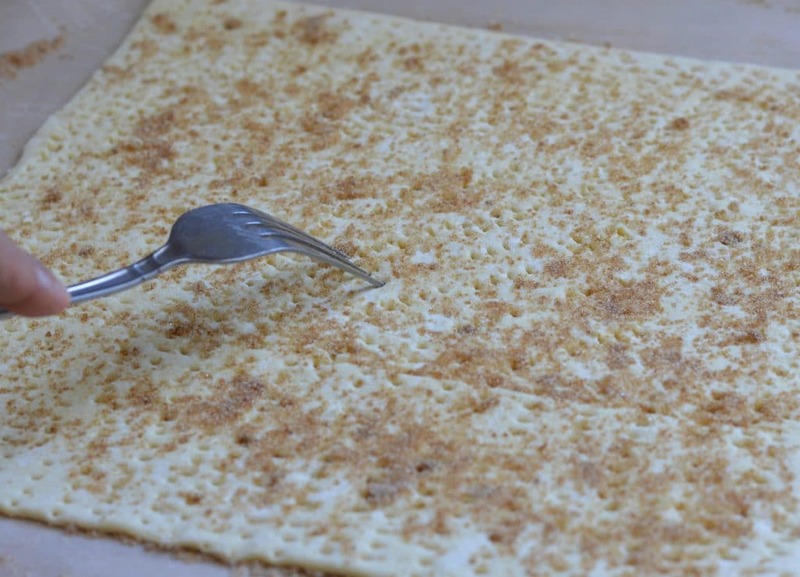 If you see it start to rise to much in the oven, you can take that same fork and poke another hole so that it goes flat again. Once it is ready, I like to cut off the edges so that you can see a perfect edge with all of the layers visible. 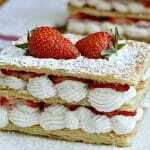 To make the whipped cream layer of the Strawberry and Cream Napoleon, you will only need three ingredients. You should also make sure that the mixers and the bowl that you are going to use are cooled down so that your cream will stay firm. To do this, I put the bowl and the mixers in the refrigerator for about 20 minutes before making the cream. You can make this by hand as well with a regular whisk, but it will take you a bit longer and will require more effort. First, you will need to beat the whipping cream, and as it starts to form peaks, you will add the powdered sugar and vanilla extract and continue beating until it has the desired consistency. 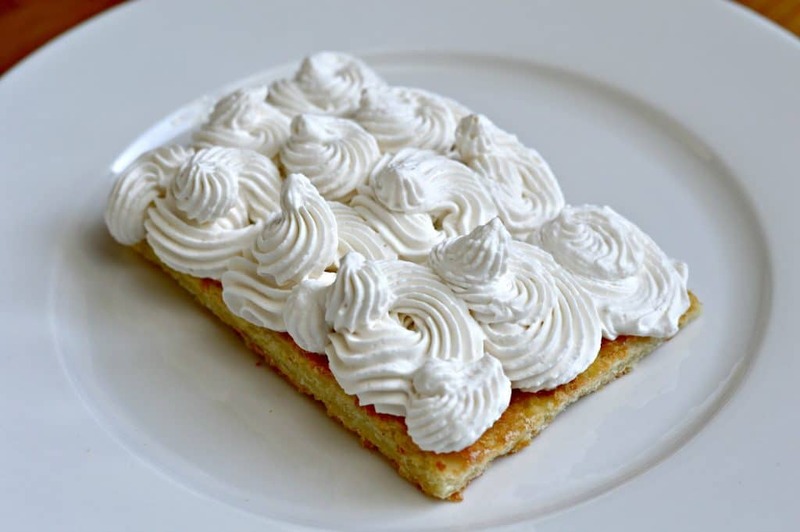 Once the puff pastry is cut into evenly sized squares, you will add a layer of your freshly whipped cream with a pastry bag. In the alternative, you can use a spoon, but it won’t turn out as pretty. 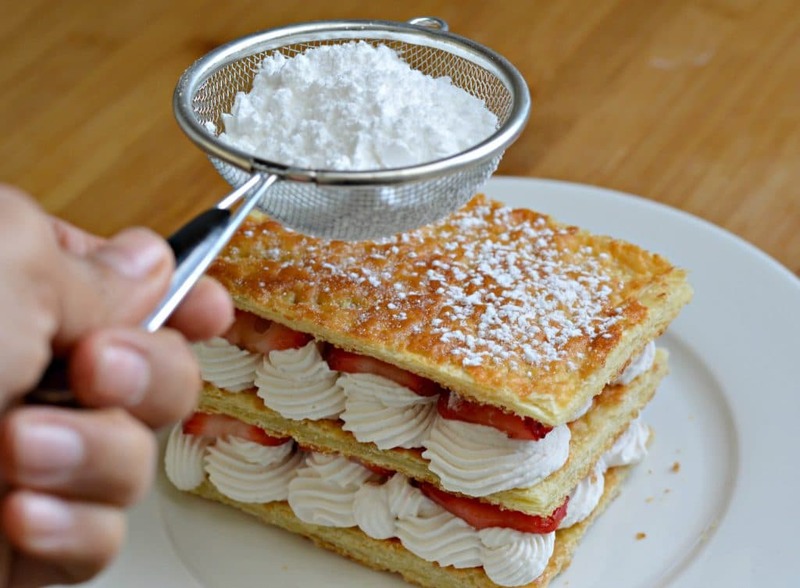 Next, add a layer of fresh strawberries that you have glazed with sugar, an repeat the process one (or more) more times before adding a final layer of puff pastry and topping with powdered sugar. Finish it off by adding some freshly cut strawberries and serve in individual sized portions for your friends and family. How did your turn out? Sprinkle 2 Tablespoons of the Sugar Combination over the puff pastry sheet and go over it with a rolling pin, spreading the sugar out evenly. 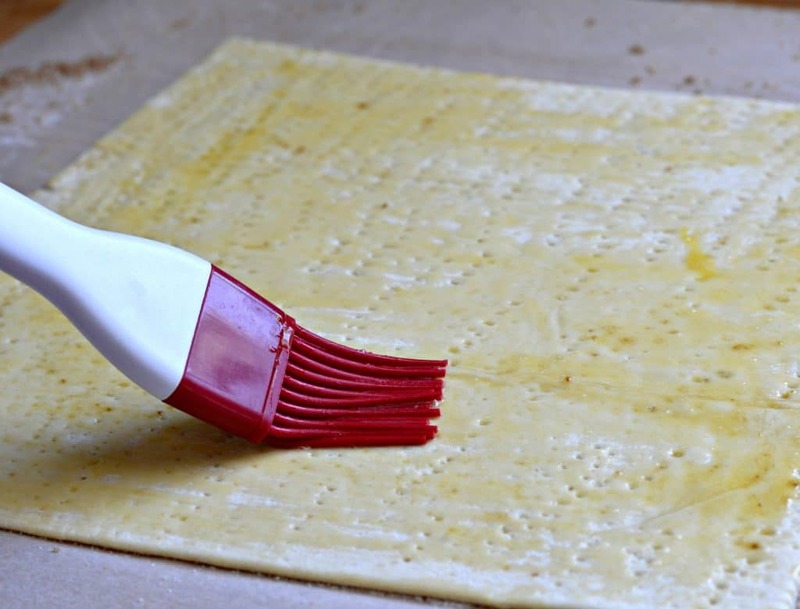 Brush on some of the egg so that the puff pastry comes out of the oven with a nice golden color. Put the puff pastry in a baking dish covered with wax paper and bake for 20 minutes at 350 degrees. Remove from the oven and let cool before cutting off around the edges so you can see all of the layers. Cut into uniform square pieces and set aside. Put your mixers and mixing bowl in the refrigerator for at least 20 minutes until cool. Add the whipping cream and beat for about 5 minutes until peaks begin to form. Add the powdered sugar and vanilla and continue beating until firm. Put a piece of the puff pastry on a plate. Using a pastry bag, add a layer of whipped cream to the puff pastry. 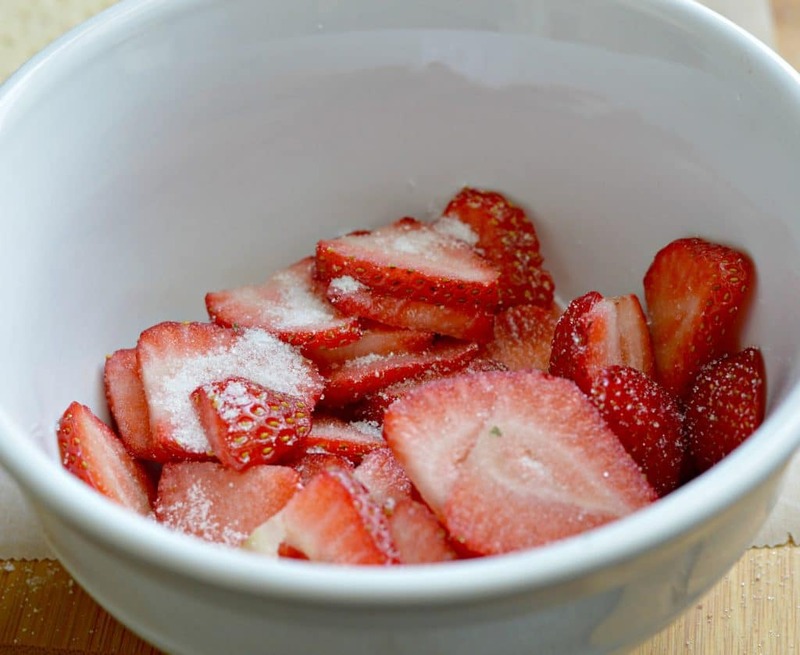 Add a layer of fresh strawberries, glazed in sugar. Repeat the process one (or more) more times before ending with a final layer of puff pastry. Add a dusting off powdered sugar to the top and decorate with fresh strawberries.